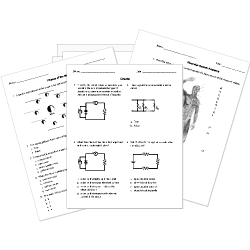 Check out our pre-made Science worksheets! You can create printable tests and worksheets from these Science questions! Select one or more questions using the checkboxes above each question. Then click the add selected questions to a test button before moving to another page. In an experiment, the variable you keep the same is the variable. What organisms make their own food with sunlight or chemical energy? In an experiment, the variable that is changed or made different is the variable. A(n) is a push or a pull. What is the role of an organism within its environment? What is the information gathered by observation or experimentation when it is not called evidence? Most of the elements on the Periodic Table are metals. What is the first step in the scientific method? animal that eats fruit and meat. Molecules in this phase of matter are tightly packed together. What is the purpose of an experiment? Colby wants to learn more about the feeding habits of ants. What steps should Colby take to best study the feeding patterns of ants? A botanist wants to see how different colored light waves influence the growth of pea plants. She puts the same number of seeds into three identical pots with the same kind and amount of soil. She then gives them the same amount of water every three days for the length of the experiment. One pot is placed into a dark windowless closet. Another pot is left on the windowsill, and the third is placed under a lamp with a green bulb. She records the height of each plant every day for three months. What is the independent variable in this experiment? A(n) is a trait that helps a living thing survive in its environment.